1. Remove the crab meat out of the shells and wash well. 3. Fry the curry leaves and onions till light brown. 4. Add the ginger garlic paste and fry till brown. 5. Add the ground coconut and saute till oil separates. 6. Add the coriander powder and turmeric powder. 7. Cook on low heat for 30 seconds. 8. Add the crab meat, salt, pepper and chilli powder. 10. Add tamarind pulp and half a cup of water. 11. Cover pan with a lid. 12. Cook on low heat for 10 minutes and then simmer till the liquid is reduced. 15. Serve hot with roti or chapati. 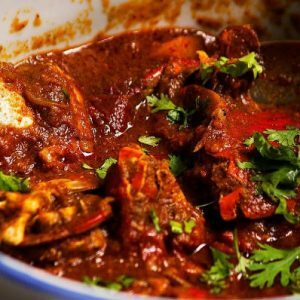 Feel free to comment or share your thoughts on this Eguru Pethelu (Curried Crab) Recipe from Awesome Cuisine.